Turkish President meets Hamas leader Khaled Mashaal as his country is reportedly set to announce normalization with Israel. Amid reports that Israel and Turkey will announce a deal on normalizing ties this coming Sunday, Turkish President Recep Tayyip Erdogan on Friday met Hamas leader Khaled Mashaal in Istanbul. According to the Turkish Anadolu news agency, the two discussed ways to resolve the disagreements among Palestinians as well as Turkish humanitarian assistance. A source from the Turkish Presidency quoted by the news agency said that Erdogan emphasized during the meeting that Turkey was keen on easing the distress of Palestinians. The meeting comes following reports in Turkish media that Israel and Turkey are set to announce the normalization of ties, cut after the 2010 Mavi Marmara incident following meetings this coming Sunday. 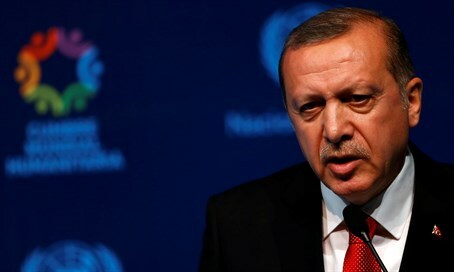 Diplomatic officials confirmed to Arutz Sheva on Thursday that Cabinet ministers will be asked to approve the reconciliation agreement between Israel and Turkey during meeting next week. The Mavi Marmara incident involved a Turkish flotilla trying to breach Israel’s naval blockade on Gaza. The main ship, later found not to be carrying humanitarian goods despite its claims, refused orders to turn around and forced IDF soldiers to board it where they were attacked and wounded by Islamists armed with knives and metal bars. The soldiers were forced to open fire to defend themselves, killing ten. Under pressure from President Barack Obama, Prime Minister Binyamin Netanyahu apologized to Turkey over the incident, and last December Israel reportedly agreed to pay $20 million in compensation to the families of the Islamists. Talks on a reconciliation agreement have stalled, however, over Gaza - and after Turkey reportedly demanded Israel lift its import and export restrictions on the Hamas terror stronghold. However, the agreement which is set to be announced next week reportedly includes some concessions on Turkey’s part with regards to Gaza.